When we set out to design our outdoor classroom we decided we wanted to stay with natural materials and make nature the true star. We attached reed fencing to our existing chain link fence that enclosed the area. This gives the space more privacy as well as enhances the area with the natural material. We are fortunate to have an existing tree in the area that provides shade and home to birds and insects, without obstructing any views in the classroom. 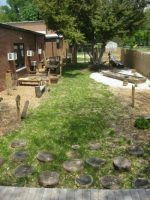 After choosing our layout we used grass, mulch, rocks, and timbers to create spaces. We added in low bushes and ornamental plants to help create a flow from one area to the next. Many of the plants incorporated bring color to the space through their flowers and leaves, creating a beautiful natural palate. These are not only visually pleasing, but attract a variety of birds and insects to the area. This provides the children the opportunity to view and interact with nature. We wanted the space to invite nature in, so that the children would have the opportunity to share the space and learn from the local wildlife. 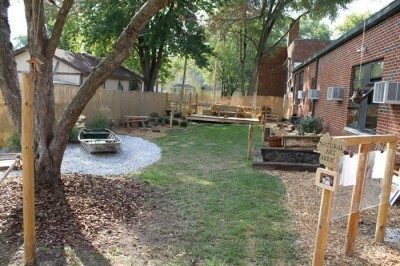 We added large planting barrels to create space for the children to grow flowers and sensory gardens. Herbs create an experience that the children can see, smell, and taste! In some areas we used tree cookies to create stepping stones and spaces for the children to gather. Benches and other seating are made from logs or wood so they do not detract from the natural environment. Our largest structure in the outdoor classroom is the stage. This low, safe structure is constructed from recycled utility poles which fit right into the natural environment. The art easels are made from recycled Plexiglas from cribs and wooden posts. Children can either clip a piece of paper onto the easel and draw, or forgo the paper and paint right on it with an unobstructed view of the plants and area around them. The whole area is visible from the wooden arbor entrance, inviting you into the space, to follow the paths and explore the area. When the classroom was completed we held an open house. Invitations were extended to our current families, the general public, and the Mayor of our city. A luncheon for the families was also held during business hours and everyone was encouraged to explore the outdoor classroom. We had dads digging in the dirt and sharing the worms they found. Families worked together to create a dam in the Water Area while others enjoyed creating music. Parents were excited to see the hands on opportunities for their children to connect with nature and to see how they too could be involved. The response has been tremendously positive.